Well eBay ain't what it used to be these days (what is?) but there is the occasional offbeat treasure still to be found there. 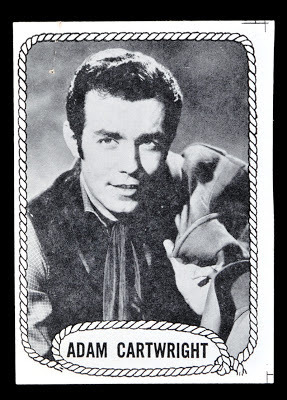 I stumbled across a few scans for the 1967 Venezuelan Topps album, which is a fantastic item, moreso because it's meant to house the most intriguing off all the Venezuelan issues licensed by Topps. As noted here previously, these sets were issued from then end of one year into the next, as that is how the Venezuelan Winter League season was played. 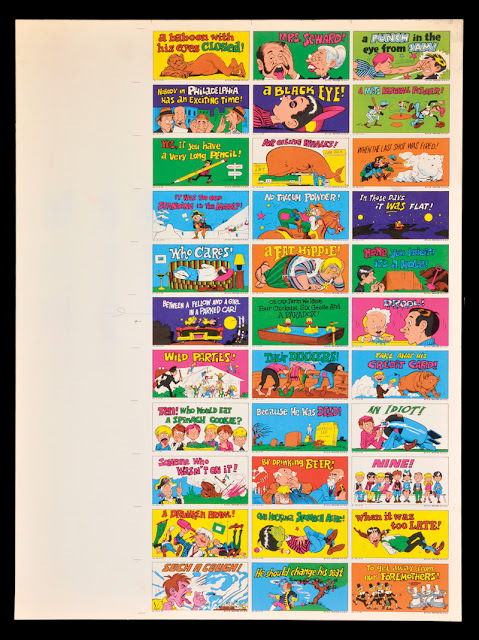 So the 1967 set is really 1967-68 and the next year's, which mimics the 68 US issue, spans 1968-69. You don't get much bigger than Luis Aparicio in Venezuela and clearly the Mick is the biggest name in the hobby here in the States. I'll have more on Topps' adventures and misadventures in Central and South America next time out. Your webmaster managed to snag a couple of scans, albeit not the card, of what I believe to be the final card in the "small" 1955 Hocus Focus set. 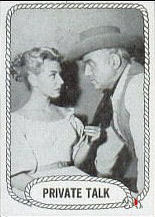 As we have seen here previously, this set was issued in 1955 in two different sizes and lengths. 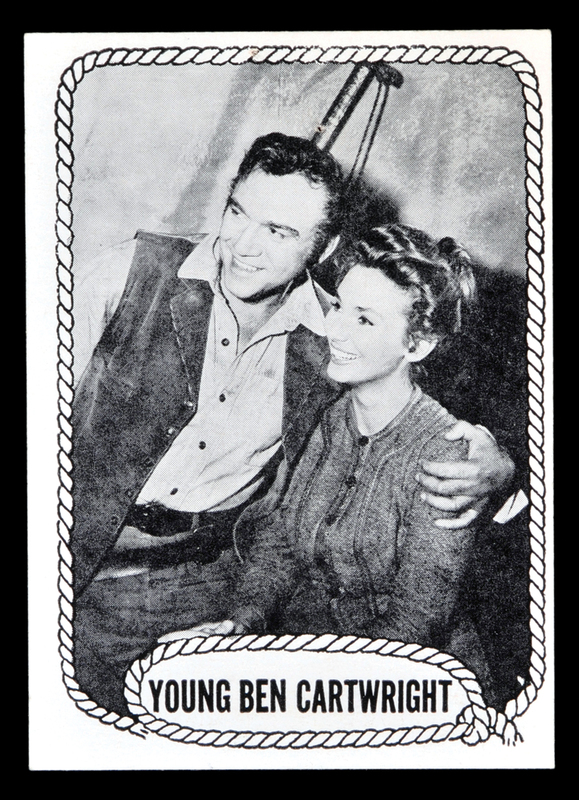 The larger cards have 96 in the set, the smaller ones go to what has been a vague number but generally thought to be 121 or 126. As faithful readers of this site know, 126 is the likely ending point. Thanks to eBay we now have a picture of #126. 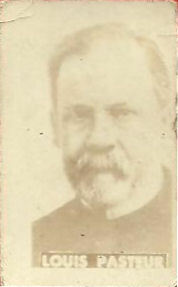 Yes, what youngster in 1955 did not want a card of Louis Pasteur?! I still need to see a representative card back from some of the subsets in the small issue but I am convinced the set goes to and ends at #126 now. Even as things get to that point, there are still holes in the checklist above #96. Crazy! Well kids, the folks at Legendary Auctions have done it again. 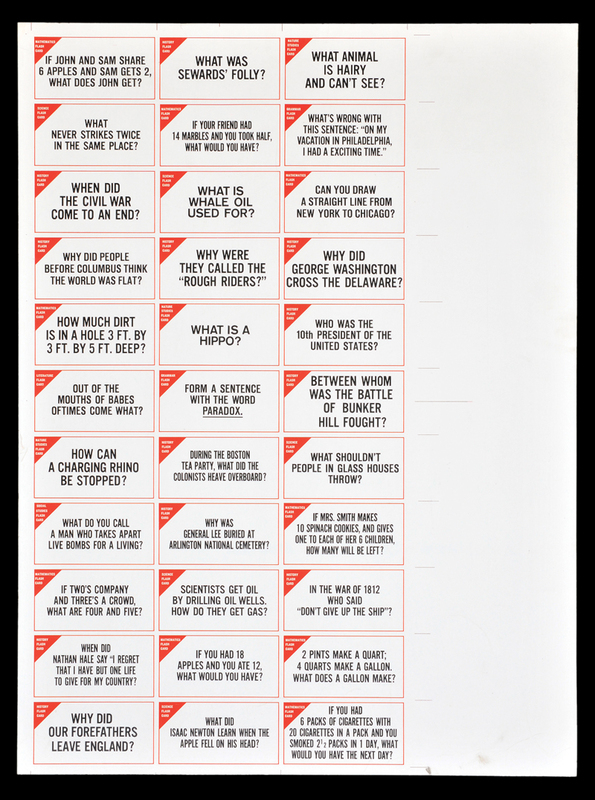 Not only do they have a massive trove of Topps related goodies in their current auction but they have answered a question or two about a set blogged upon here a little while back and dubbed Funny Flash Cards. 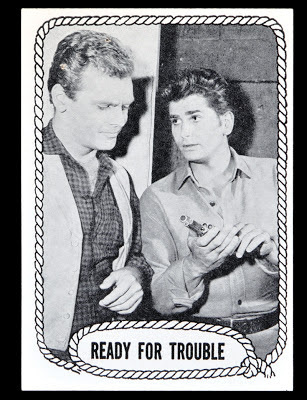 According to the writeup for the lot, the set was a test from 1968 and is considered "elusive". Agreed. I did say uncut proof sheets, didn't I? 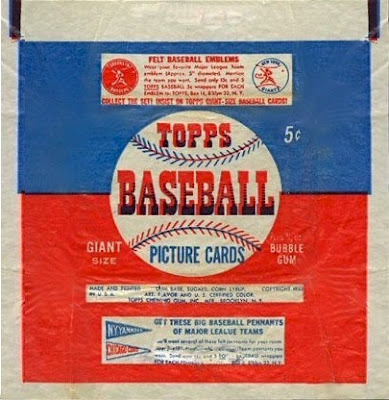 Topps would often proof series or sets in two batches. Usually one batch was meant to be double printed and was separated from the other but we can't tell which one was which here, 33 or 22. No wrapper is known still, so distribution is a bit murky. 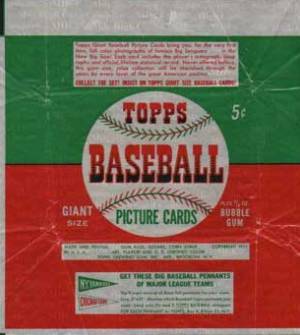 One of the more enduring hobby stories has been that 1952 Baseball high numbers could be found in 1953 Baseball packs, especially in Canada. I'm pretty sure I know why this is so but have never really made the full connection until now. 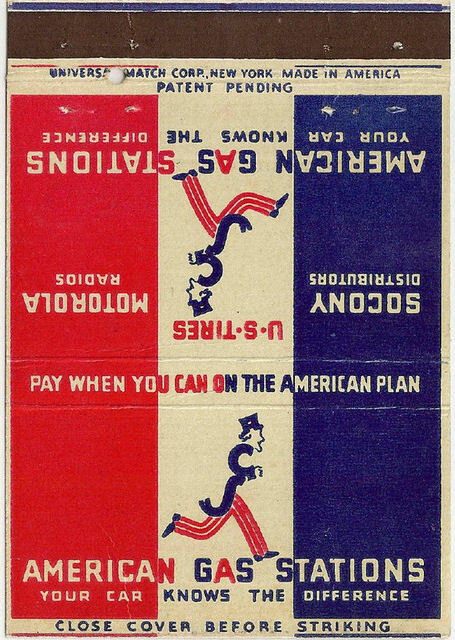 Above the pennant offer is a block of information that includes a 1952 copyright date. So the "emblem" wrapper was either trotted out again or the continuity is all screwed up, which is always a possibility with Topps. That blue block of color also appears jury rigged-look at how it does not seamlessly transition to the red portion of the wrapper. 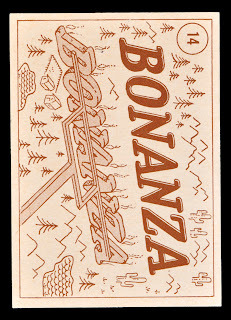 Once again using a scan from Cardboard Connection, you can see the orientation has changed to vertical and the baseball design element has been rotated a little. This version clearly identifies 1953 on a side panel and moves the copyright from upper right corner in the ingredient panel to lower left (and it's in a red font to boot). 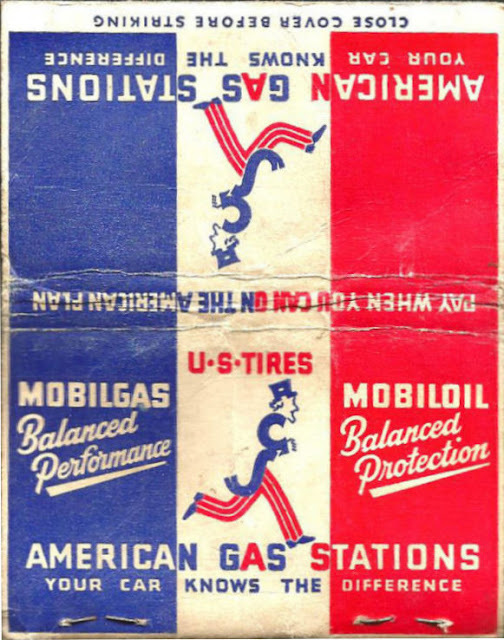 The Bazooka ad though, is so prominent the other differences are almost moot, although the '52 uses a darker blue. Interestingly the 1953 dating on the right side panel is gone, to match the removal of the date on the front. I think Topps did this as the year wore on to allow sales to continue after the season ended. 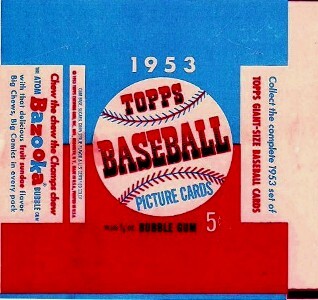 It sometimes took many months for each series to be fully distributed across the U.S.
Now any theory concerning Topps is subject to something coming out of left field to dispute it but I think the similarity of the 1953 wrappers with the 1952 high number packaging is one reason veteran hobbyists think the '52 highs came in '53 wrappers. 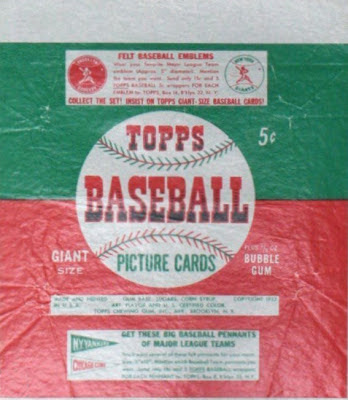 There are also reports of 1st series '53 packs having 52 high's mixed in with them out there so there may be something to that as well. Bump-Da Bump-Da Bump-Da Bump-Da Baa Baa Bump-Da-Da Bump-Da-Da Bump Ba Da Da Da Dah! 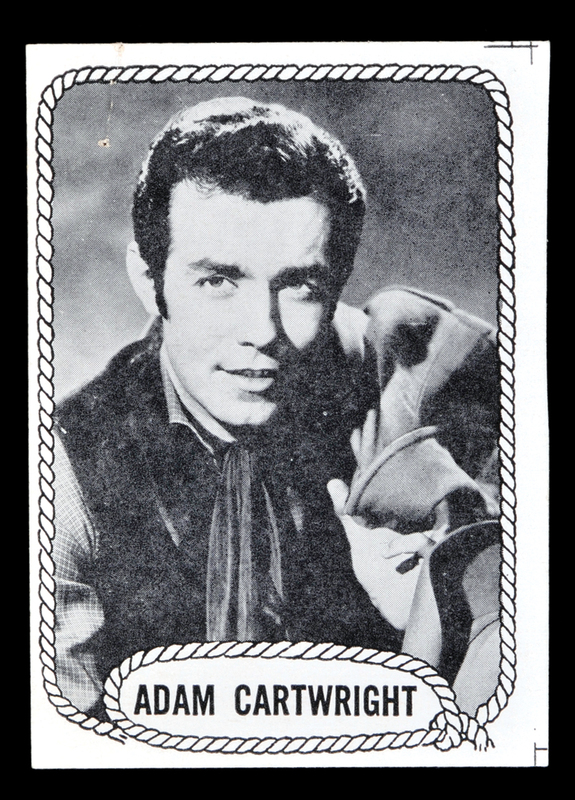 Even the Adam Cartwright card above, which has not been sighted previously by yours truly, was previously know per a checklist in the Non-Sports Bible. When you piece it all together, it seems like there may only be five or six different cards,which supports the in-house production theory quite well. 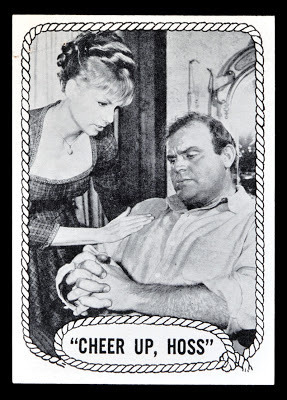 Still, these are finished cards so maybe they got a little past that phase. We'll know in a few weeks what the hobby values them at but I suspect these will be sitting in PSA holders shortly thereafter. Quite the month when it comes to matchbooks buccos! 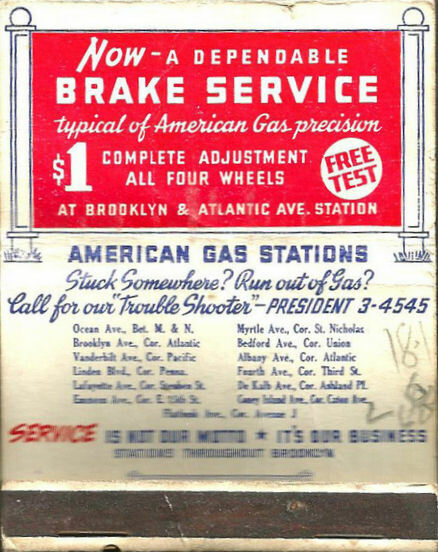 As many of you know, the Shorin family under the auspices of youngest son Joseph, ran a chain of Brooklyn gas stations from 1928-38, the sale money from which helped start Topps. 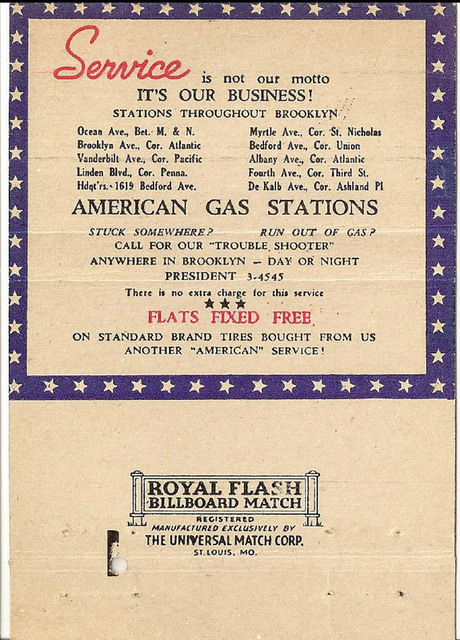 Called American Gas Stations (AGS), the firm snapped up properties during the Depression and built over a dozen distinctive looking stations, all of which appear to have been torn down now (one had remained intact until a couple of years ago). 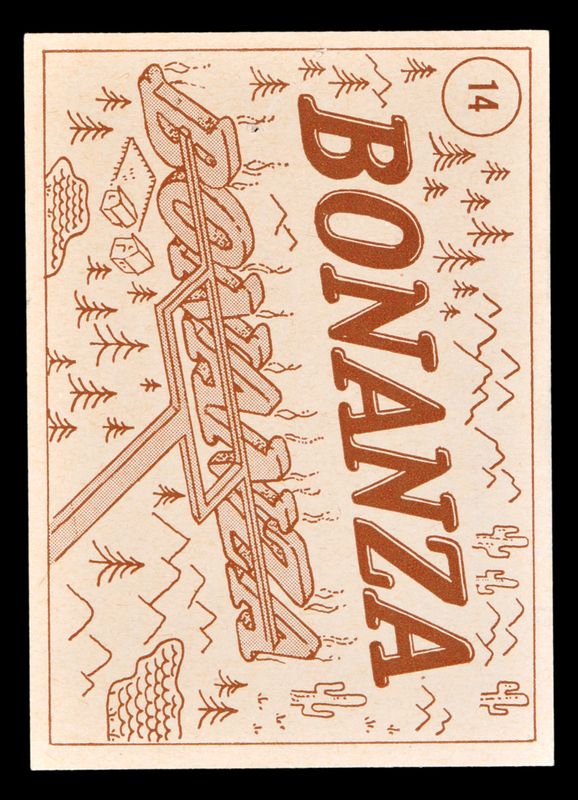 I had tracked down a scan of a matchbook from the company a while back and managed to snag an example two weeks ago, although it is rough and miscut. No matter, a scan of a better one was posted here a while back. 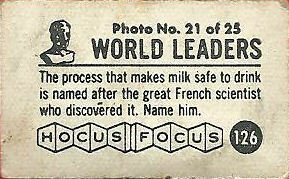 The number of locations places this around 1932 I think. I googled their HQ and it was basically convenient to the neighborhood where most, if not all, of the Shorin family lived at the time. An early Topps issue that is a bit unknown to many collectors, Funny Foldees were originally issued in 1949 and then reissued in 1955 (or thereabouts). In between there were a number of design changes made to this metamorphic set of 66 cards. As you can see, nine different pictures were possible (Oh, if only there was a bear instead of a woman....) but the real trick these days is finding examples that have not been folded. And is it cheating if three of the pictures are unaltered? 1-11: Yellow, 12-22: Blue, 23-33: Red, 34-44 and 55: Orange, 45-54 Green, 56-66 Yellow. Why #55 is out of sequence is real head scratcher. There were a number of subjects that ended up redrawn, one of them actually was redrawn twice. I hate to be a tease but until I have scans of the ones that were changed I am not going to post the differences! I will tell you though that the numbers involved were: 9, 13,14,19, 26, 29, 39, 48 & 51. I always wondered why an updated card was made by Topps and it turns out Joe rejoined the Today Show in 1990 before leaving again in 1992 (he had been there previously from 1967-73). 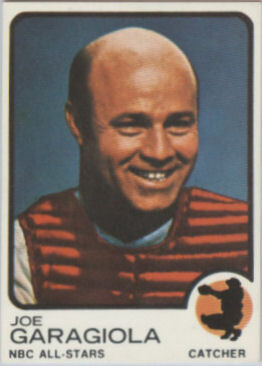 The original baseball card was produced since he was member of the broadcast team for Monday Night Baseball on the network at the time, in addition to some other duties. 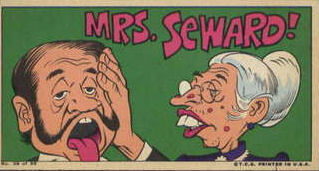 I do not yet have a back scan of the '91 card but I am sure one will turn up.